All worship is now at the new church. Men’s “Bread & Breakfast” Bible Study Takes on Giants! 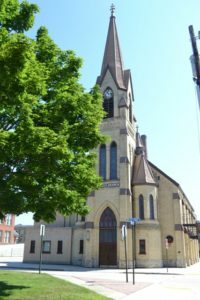 Whether you’re looking for church family – or have already made your home with us, welcome to St. John’s Lutheran Church of Two Rivers, WI. Since 1863 we’ve been proclaiming, celebrating and seeking to strengthen the connection between Christ and his lambs of all ages. And in the process, we’ve also come to treasure the connection God establishes between us. Together we hold to the Bible as the inerrant, verbally inspired Word of God – his undeniable truth for our lives. The result is a growing, caring family that welcomes newcomers with open arms.